That's up from 10.7% in January and the highest level since the introduction of the single currency in 1999. Spain has the highest rate of 23.6%. Meanwhile, a separate report confirmed that manufacturing activity in Europe shrank in February. It is the eighth month in a row that the Purchasing Manager's Index has been below 50, which indicates contraction. France was particularly weak, with manufacturing activity falling to the lowest level in almost three years. "Eurozone manufacturers suffered a miserable March, with a renewed downturn in production wiping out marginal gains seen in the first two months of the year," said Markit chief economist Chris Williamson. "Manufacturing is therefore likely to have acted as a drag on economic growth in the eurozone in the first quarter, falling to a lesser extent than in the final quarter of last year but nevertheless failing to prevent the economy sliding back into recession," he said. Other economists agree that the euro area is probably in recession. "It looks odds-on that eurozone GDP contracted again in the first quarter of 2012, thereby moving into recession," said Howard Archer, chief European economist at IHS Global Insight. "And the prospects for the second quarter of 2012 currently hardly look rosy." The slowdown is creating a tough environment for job seekers. Italy saw unemployment hit 9.3% in February, the highest level since the country started collecting monthly figures in 2004. For those aged between 15 and 24 the rate was 31.9%. 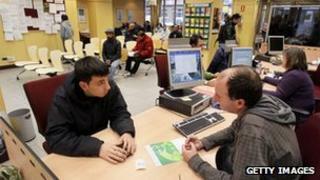 Prime Minister Mario Monti is trying to push through reform of the labour market, which he says will boost employment. The lowest unemployment rates among countries that use the euro are to be found in Austria (4.2%), the Netherlands (4.9%) and Germany (5.7%). Confidence among European business leaders has been undermined by Europe's debt crisis. Finance ministers will hope that an agreement to increase the size of the eurozone's rescue fund will help bolster sentiment. They agreed to boost the joint lending power of the "firewall" from 500bn euros ($668bn; £416bn) to 800bn euros ($1.1tn; £667bn). The firewall is the permanent mechanism to bail out troubled euro zone nations.